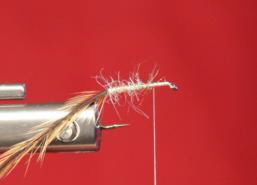 The Buck Caddis is probably the most fished caddis imitation. This pattern exists in infinite variations - variations in the colors but also in the materials used. Just consider the difference between summer and winter fur. It is a great allround fly and is usually fished as a dry fly. Its success is due to its excellent floating properties as well as its great silhouette. It remains relatively visible for the angler even in white water. With just a short wing stub it may be fished as an emerger just below the surface. It may draw violent takes from fish that even break the surface to make it look as though they were jumping at insects up in the air. This may take place in many fisheries especially in summer or late summer. Here you will find a fly tying instruction for the Buck Caddis by Wolfgang Fabisch. 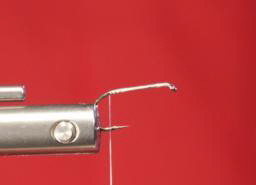 1) To properly hold the other components, cover the hook shank with tight touching wraps. 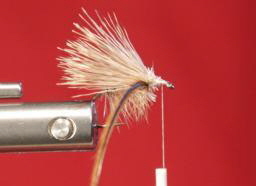 2) Tie a brown hackle to the hook bend, making sure it can´t slip or wobble. 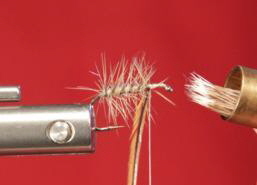 Instead of brown, you may also use gray, black, or olive hackles. 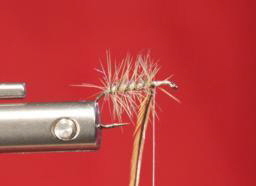 3) Now dub your tying thread and wrap a body in the desired thickness. For a more voluminous body you may add additional layers of dubbing. In any case, leave some room between body and the hook´s eye. 4) Palmer your hackle along the hook shank, again leaving sufficient room behind the eye. DON´T cut your hackle at this point! 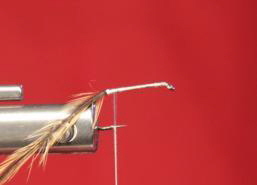 5) Take a small bunch of deer hair and align the tips in a hair stacker, then tie it in behind the eye. Take care not to tie in too thick a bunch, otherwise you´ll have a hard time controlling it. 6)I usually cut this bunch to suitable length before tying it on to avoid to much trouble trimming the ends near the eye - which will flare as you tie them on. 8) color your thread to your liking with a waterproof marker and make a whipfinish. Done! This fly can also be fished very well in the swing after it has been in a dead drift for a while. I have had a lot of success on steelhead fishing a Buck Caddis tied on #4 hook. On larger rivers you fish it in a swing only (across and around), whereas on smaller rivers fishing it upstream in a dead drift may very well work just fine. Especially if there´s several steelhead lying in a tailout, it may provoke unexpectedly violent attacks. 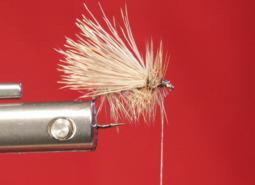 In fisheries allowing multiple-fly rigs, the Buck Caddis may also serve as a strike indicator on a short leader for a small dry fly, wet fly, or nymph. Tight lines, Wolfgang.